Attorney Jack L. Moser, Jr., is a skilled, knowledgeable and qualified attorney who practices law throughout the state of Ohio. As a full service firm in the process of growing, the Law Office of Jack L. Moser, Jr., is networked with other attorneys who provide quality legal representation in many areas of law. Jack L. Moser, Jr., was born in West Virginia, but grew up in a town outside of Atlanta, Georgia. As a young man seeking a way to pay for higher education and college, attorney Moser joined the military and enlisted in the United States Air Force. Jack Moser served four years as an Air Traffic Controller, where Moser did his part to keep the skies above safe by ensuring proper aircraft separation in the air and on the ground. Attorney Moser also served time overseas, where he observed and came to appreciate that people and cultures may be different in many ways, but generally all people want some sort of order in their everyday existence. While in the Air Force, and when able, Jack Moser attended night classes at a community college in Hampton, Virginia, where he came to appreciate the diverse opinions of adults from different areas of employment and backgrounds. After his enlistment and as a full time student attorney Moser was accepted for transfer to the College of William and Mary, in Williamsburg, Virginia. At such a reputable institution Jack Moser studied government and economics, as well as other subjects to round out his education. He received a Bachelor of Arts in Government in 1994. After graduating from the College, Jack Moser went to work for an organization in Washington, D.C., that oversaw and ran specialized programs for the United States Agency for International Development regarding privatization of industry in the former Soviet Union. Afterward, he enrolled in law school, at the Capital University Law School in Columbus, Ohio. During his second year at Capital University Law School, Jack Moser began working as a law clerk in the felony division of the Franklin County Public Defender. Attorney Moser learned hands-on how the legal system worked by helping staff lawyers conduct arraignments, interviewing jailed clients, and writing motions and briefs that argued points of law and fact for the staff attorneys. During his second year Jack Moser also wrote and published an article for the Capital University Law Review, entitled: The Secularization of Equity: Ancient Religious Origins, Feudal Christian Influences, and Medieval Authoritarian Impacts on the Evolution of Legal Equitable Remedies, 26 Cap. Univ. L.R. 483 (1997). The article since has been cited by many other scholars, as well as by several courts in legal opinions. During his third year of law school Jack Moser enrolled in the Capital University Legal Clinic, where he was able to practice law and argue cases in court as a third year law student before graduating law school. Over the course of two semesters, attorney Moser litigated or tried before a judge many various types of cases, such as landlord tenant disputes, divorce cases, dissolutions, criminal cases, and others. During the same time and under the same program, Jack Moser also prosecuted multiple cases for the village of Obetz, Ohio. Jack Moser passed the bar exam and immediately opened up his own downtown Columbus law office in 1999. Since then, he has developed his experience and skills by arguing, defending, and taking to trial many types of cases. As well attorney Moser has grown his office to include a network of attorneys who serve multiple clients in various areas of law. A few years ago, Jack Moser became a member of the Capital University Law School paralegal faculty, teaching tort law, contract law, and legal foundations in the paralegal program. He continues to teach these subjects to new paralegal students every year. 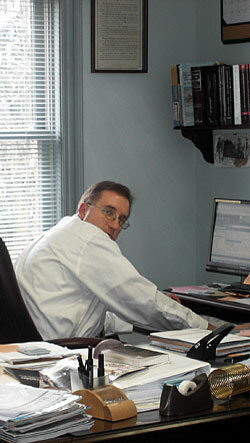 In 2008, attorney Moser opened his office in Gahanna, Ohio, a suburb of Columbus, to better serve his clients. Attorney Jack L. Moser, Jr. is licensed to practice law in the state of Ohio, the United States District Court for the Southern District of Ohio, the United States District Court for the Northern District of Ohio, the United States Court of Appeals for the Sixth Circuit, and the United States Tax Court. Jack Moser is also a member of the American Bar Association, Ohio State Bar Association, the Columbus Bar Association, the Ohio Academy of Trial Lawyers, the American Association of Justice (formerly the American Trial Lawyers Association), and the Ohio Association of Criminal Defense Lawyers.